Chinese dentist Yu Qian has a novel way to remind his patients that they need to brush their teeth three times a day. You see, over his 15 years of dentistry, he’s had to yank a lot of teeth. 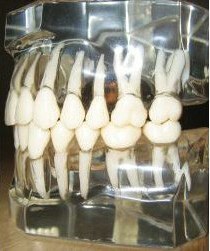 Out of his estimated 100,000 customers, he’s harvested 28,000 teeth, most of which were victimized by tooth decay and rot. Using those 28,000 teeth, he’s built one impressive statue out of rotten molars and rancid bicuspids. The unusual tower is over 8 feet tall and consists of teeth harvested from his own patients (built with the help of Dr. Yu’s six students). Just think about it this way: he built this tower out of teeth over the past 15 years. Imagine how many teeth he had to pull from patients’ heads before he decided to build this statue! I’ve seen some odd art made of old teeth, but you don’t just one day decide to randomly build a tower out of old teeth; that’s a decision you have to come to gradually! This is the kind of decision you make after you pull your 5,000th tooth or something. There’s no telling how tall this statue might have been if Yu had been collecting teeth since he got his start crafting grills and paying bills.